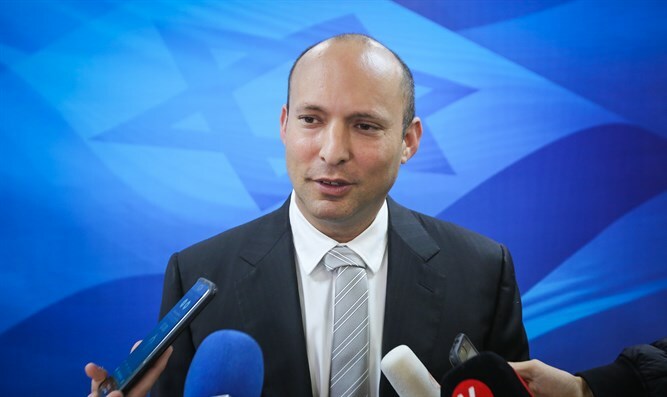 Education Minister Naftali Bennett (Jewish Home) set his sights on the Defense Ministry portfolio Thursday, declaring his intentions to succeed incumbent minister Avigdor Liberman (Yisrael Beytenu) after the next Knesset election. Bennett, who has in other recent interviews mentioned his interest in leading Israel’s Defense Ministry, said he would demand the position during the coalition negotiations for the next government – assuming that Prime Minister Binyamin Netanyahu is elected for a fifth term as premier. The Jewish Home chief recently told Politico that plans on running for Prime Minister once Binyamin Netanyahu resigns from politics, but in the interim would seek the Defense portfolio. The Education Minister then cited a series of recent security decisions, and noted his opposition to concessions in each case, including the removal of metal detectors from the entrances to the Temple Mount follow mass protests by local Muslims, and the return of terrorists’ remains following terror attacks.